with height = 1.0, and a picker view that is attached on it with Autolayout (it appears below the view). 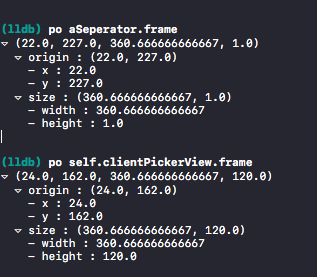 My picker view's width should be equal as the line seperator (the UIView). On iPhone it works great, but on iPad the picker view is sliced in the middle. I tested in the "Debug view hierarchy", and saw that it is actually in the width of the view, but still cut in the middle (see screenshot added). The solution was to move this call to viewDidLayoutSubviews.